Liquid bottle shampoo with pump to clear and clean suede skin, Nabuk, Alcantara and Can of any color, keeping the original softness unaltered. Remove any dirt or scum on the footwear with the Calzanetto Camoscio sponge. 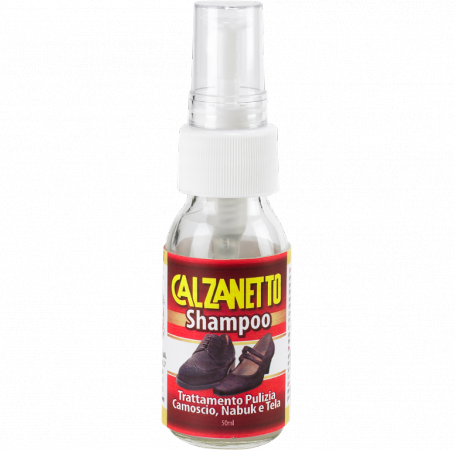 Spray Calzanetto Shampoo onto the entire surface to be treated and then brush it in all directions until it is dampened. The skin at this point of treatment will be darker, but once dried, the color will return to be the same or very similar to the starting point. For this reason we recommend treating the whole surface and not just the individual spots of a shoe and possibly handling the whole pair. Allow to dry and brush again. Smooth Skin, Leather, Greasy Skin and Paint.